The Arc recently paired up with the dynamic duo of Chris Engler and Joe Jelinski, the co-owners of Eruption Athletics, to present at the National Down Syndrome Congress Conference. Together, The Arc and EA, presented 3 health and fitness sessions – 1 to the general conference and 2 interactive fitness sessions with their Youth and Adult conference for self-advocates. Eruption Athletics (EA) was created in 2009 to help prepare individuals competing in Special Olympics’ games. Since then the organization has evolved into an adapted fitness facility designed specifically for individuals with disabilities to come to work out and learn more about health and fitness. Located just outside Pittsburgh Pennsylvania, EA first partnered with The Arc’s Achieva Chapter to help do fitness sessions at their free health assessment events as part of the HealthMeet project. Joe and Chris help empower their clients with the knowledge of how to be physically active to build strength and endurance while preventing injuries. They provide personal one-on-one or group training sessions. Their program instills in their clients an attitude that there is nothing they can’t do because of their disability and shows them that exercises just need to be modified or adjusted to fit each individual’s specific needs. Spend two minutes in a room with Joe and Chris and you’ll know why they have a dedicated following of clients that continue to come back. Their bright colored clothing matches their high energy vibe and excitement that they bring to each training session. Individuals that come to their classes are not only becoming more physically active they are also developing socially and cognitively. The group sessions with peers masks working out by providing a fun, social, and supportive environment that makes individuals actually look forward to exercising! It gives them a place to go each week to see old friends, meet new ones, and be part of a group that encourages each person to fulfill their own potential without comparison to others in the program. Their innovative approach to physical activity is helping to improve their clients physically and mentally by not only building muscle, but also self-confidence through proven results. EA has recently released their new patented Eruption Athletics “Volcano PADD”. The PADD along with the accompanying instruction manuals that vary from beginner to advanced makes exercising easier, fun, and more accessible for individuals with disabilities. 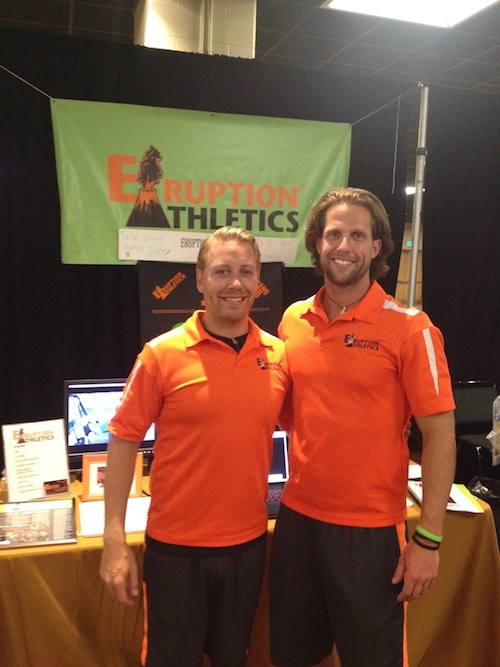 To learn more about EA’s Volcano PADD, contact Eruption Athletics. This isn’t the last you’ll be seeing of Eruption Athletics though. They will be joining us in October down in New Orleans for The Arc’s National Convention. Joe and Chris will be combining forces with the HealthMeet project again to provide morning fitness sessions – so make sure to find out what all the hype is about and join us in New Orleans for our energizing sessions to get your day started right (and make some new friends in the process!). This entry was posted in Programs and Supports and tagged Convention, Eription Athletics, Fitness, Health, HealthMeet. Bookmark the permalink.